Marcelo Bielsa’s Leeds United are having something of a blip. It’s not especially serious, the club could be back at the top of the Championship soon, but it’s obviously given a chance for Bielsa’s detractors to have a bit of a go. And, apparently, the cult manager does have some detractors. For everyone who enjoys his style of play and absolute commitment to the game, there’s usually another who will point out Bielsa may have the best of intentions but it doesn’t often to lead to actual glory. La Nacion, Argentina’s main newspaper, reported over the weekend that the manager’s Leeds United have been ‘punctured’. La Cuarta, in Chile, say this led to a meme doing the rounds. 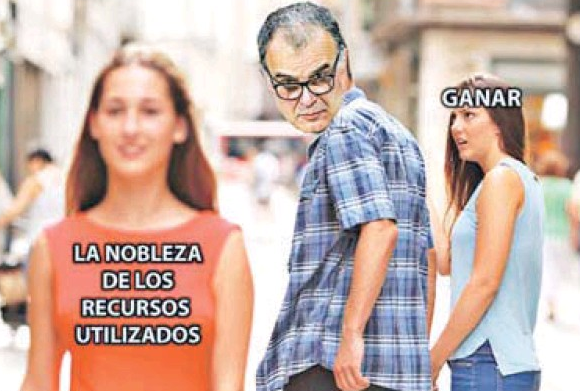 It’s the well used image of a man looking at the women he isn’t actually with, but with his head replaced by Bielsa. The Elland Road boss is seen as turning away from ‘winning’ and being distracted by ‘the nobility of the resources used’.